A classical intermittent karst spring. For 30 minutes the water flows out at a minimum of 50 and a maximum of 1,800 litres per second (depending on precipitation). Then it stops completely for another 30 minutes only to start flowing again. This behaviour is due to the geometry of the chambers and connecting conduits, and having to fill to a certain level before draining. Fontaine de Fontestorbes, Central Pyrénées, France. Click for larger view. Of all the landscapes decorating our planet, only one continues below the earth’s surface. Deep inside limestone rocks (high in the mountains or under the sea) there is a kind of mirror image of the surface, a subterranean landscape—a world of caves. Caves are part of a larger feature called karst—rough limestone country with underground drainage. The word probably goes back to the archaic karra, meaning ‘stone’. 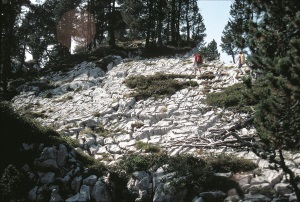 Austrian geographers of the Kras region Germanicized it to ‘Karst’, which is the accepted scientific term. 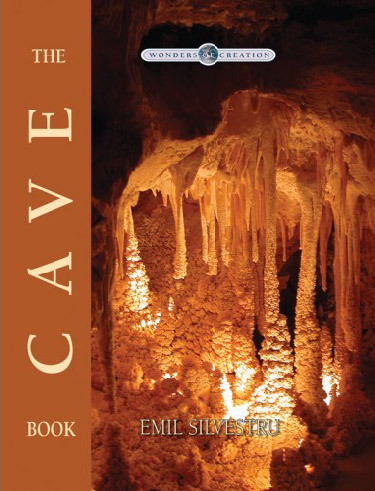 From boyhood, I have been enthralled by the numerous caves of Transylvania, the province of Romania where I was born. This fascination has led me to study geology and into a lifetime of scientific adventure, exploring and studying caves all over my native land and elsewhere. What makes karst unique? Its rivers, as if hiding some shameful secret, choose to flow underground, sometimes more than a mile (1.6 km) deep and seven miles (11 km) long. Rainwater infiltrates the rock and slowly seeps or hastily runs to join these deep, dark rivers. A large uvala (enclosed hollow formed by the merging of numerous sinkholes). Note the flat bottom (due to sediment infill) on which small suffusion (draw-down) sinkholes formed. Almost every sinkhole is ‘inhabited’ by spruce and fir (because they preserve snow and rainwater). Balileasa, Padis Plateau, Apuseni Mts., Transylvania, Romania. Click for larger view. Tectonic karren (limestone pavement) overlapped by gravitational karren (the grooves parallel to the slope). Hohgant Range, Swiss Alps, Switzerland. Click for larger view. The acid reacts with the solid calcite (calcium carbonate or CaCO3) that makes up most of the limestone, taking some of the calcite into solution. The stolen calcite leaves a void behind and winds its way in solution towards the underground streams. Like a satiated snake ignoring potential prey under its nose, the saturated fluid now passes through the limestone leaving it untouched. But if it happens to meet a larger void—a cave—the saturated water ‘awakens’. Its CO2 readily bubbles away, forcing the dissolved calcite (now calcium bicarbonate) to return to its original crystalline state. This is how dripstones (such as stalactites and stalagmites), curtains, flowstones, etc.—speleothems in one word—rapidly form. These do not just beautify the darkness of the caves—they also fill them. Often a large void becomes completely blocked with new, almost-pure calcite, which is structurally stronger than the limestone itself. Where does this underground ‘water on the move’ go? Just as mysteriously as it sank into the ground, ‘adult’ rivers, sometimes huge in size, burst out of the limestone. Their exits are usually called emergences or karst springs. Karst aquifers store enormous volumes of good water, keeping subterranean rivers alive in times of drought. The underground world of karst is certainly dramatic, but even the surface features are unlike most other landforms. The unsaturated water begins its meal on the limestone at the surface. Here, looking like the face of a very old person, the barren rock is full of wrinkle-like grooves and runnels called karren, which can cover large areas as limestone pavements. Large funnel-shaped depressions called sinkholes (on the North American continent, dolines in Europe) pock the face of the earth. They collect the runoff and rush it towards the underworld. 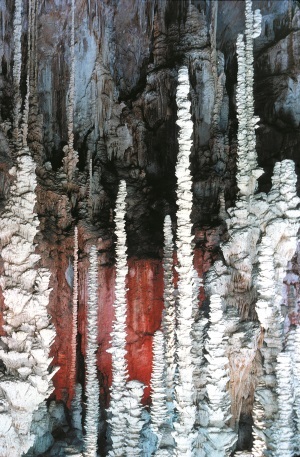 The ‘Mammoths’: very large stalagmites towering nearly 20 m above the cave floor. Reds and browns are mainly due to iron hydroxides and organic matter. The whites are pure calcite. Dârninii Cave, Apuseni Mts., Transylvania, Romania. Click for larger view. A through cave, i.e. the river flows through a natural tunnel. Humans have made use of it by cutting the smaller hole on the right to let a local road penetrate into the cave and exit a couple of hundred metres downstream. Important ancient human artefacts were found in the cave. The cave Mas d’Azil, Central Pyrénées, France. Click for larger view. Before deciding whether to flow under the sun or in absolute darkness, many rivers cut spectacular deep gorges—some of them among the world’s most beautiful! Once a river chooses the world below, it often disappears at the foot of an escarpment that abruptly ends what is called a blind valley. In almost perfect symmetry, the river returns to daylight at the foot of another escarpment, representing the abrupt beginning of a blind gorge called a pocket valley. Here and there, windows open to the surface, connecting the two worlds by means of caves or vertical shafts. We are told that caves take a long time to form. Even more so since thousands of radiometric ‘age’ assessments on speleothems yield ‘dates’ up to a million years or more! And the particular radiometric methods used are claimed to be the most accurate of them all. We must first emphasize that despite much effort, secular science (karstology in this case) still does not have an acceptable explanation of how water can manage to form large caves hundreds or thousands of feet underground. To eat away the limestone, the water must be acidic. How does it get deep inside the rock without losing its acidity? Thousands of measurements show that by dissolving limestone, the water loses its acidity within some 10 metres of the surface.3) It is only possible for water to flow deep underground if it follows pre-existing conduits. But when and how were those conduits formed? I believe it was at the time of the Flood, by hydrothermal solutions (HTS). These hot and chemically hyperactive solutions originated deep inside the earth as a result of the tectonic and volcanic processes associated with the global upheaval. These HTS could eat away enormous amounts of limestone in a year or even less. A somewhat similar process was documented in the Carlsbad Caverns area (New Mexico, USA). There, sulfuric acid, formed from hydrogen sulphide (H2S) that was produced from the oil deposits underneath, ate away the limestone. After the Flood the HTS from deep underground died away and the solutions linked to water seeping from the surface took over the caves and started to reshape everything. The slow processes we can see and measure today are not the ones that created the caves. They only added the ‘final touch’ to what HTS created quickly at the time of the Flood. What about the radiometric ‘dates’? These are not to be accepted because they are based upon several unprovable assumptions, and have been shown (for rocks of known age) to be wildly inaccurate.5 The situation is worse for the dating of caves. The methods completely ignore the significant chemical changes which the HTS would have induced in the distribution of the radioactive isotopes—a major source of potential error. And they overlook the fact that stalactites, stalagmites and other speleothems have been observed to grow rapidly. Such observations mock the radiometric ‘age’ results (see box, How logic is stretched to accommodate long ages, below). 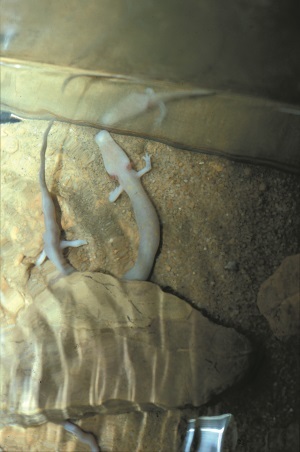 Proteus anguinus (‘cave olm’)—a distant aquatic, blind and pigmentless relative of the salamander—bred in plastic tanks. Aulignac Cave, Central Pyrénées, France. Click for larger view. Strip away the long-age presuppositions, and the facts about caves are wonderfully consistent with the true history of the world given in the Bible. In addition to being immensely beautiful, caves are a spectacular reminder of the massive physical and chemical processes that accompanied God’s watery judgment upon the world of Noah’s time. Emil Silvestru, M.Sc., G.Eng., Ph.D., obtained his Ph.D. in geology from the Babes-Bolyai University, Romania, where he was Associate Professor of Karstology. He was head of the nearby Speleological Institute and is a world authority on cave geology. 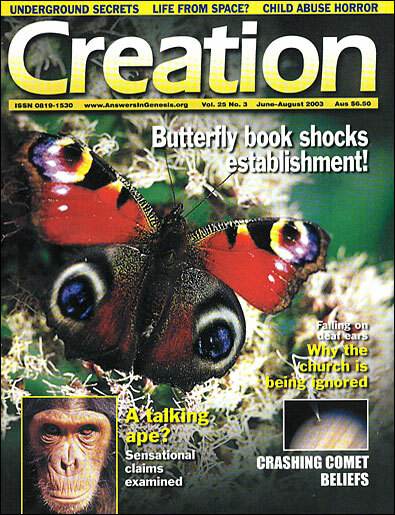 Dr Silvestru is now a senior scientist and speaker with Creation Ministries International, Canada. Mercator, G., Atlas sive Cosmographicae Meditationes de Fabrica Mundi, Amstelodami, 1606. Return to text. Ford, D.C. and Williams, P.W., Karst Geomorphology and Hydrology, Chapman and Hall, London, p. 155, 1992. Return to text. Ref. 2, p. 116. Return to text. Hill, C.A., Geology of Carlsbad Caverns and other caves in the Guadelupe Mountains, New Mexico and Texas, New Mexico Bureau of Mines and Mineral Resources Bulletin 117, 1987. Return to text. Snelling, A., Radioactive ‘dating’ in conflict: fossil wood in ‘ancient’ lava flow yields radiocarbon, Creation 20(1):24–27, 1997; Snelling, A., Dating dilemma: fossil wood in ‘ancient’ sandstone, Creation 21(3):39–41, 1999; Swenson, K., Radio-dating in rubble, Creation 23(3):23–25, 2001; see also Q&A: Radiometric dating. Return to text. 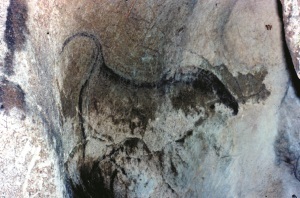 Cave painting representing a young aurochs (extinct wild ox). This painting shows great artistry and accuracy (including the typical raised tail). 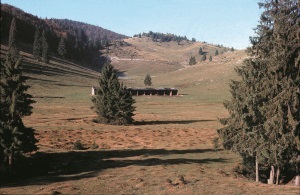 Gotte de Gargas (cave), Central Pyrénées, France. Click for larger view. Cave paintings: Bison and ibex wounded by arrows—typical hunting ritual drawings. Note the simplicity and powerful expression of these ‘primitive’ drawings. And consider the lighting conditions the artists had at hand: a dim, flickering flame of a carved stone oil lamp! Grotte de Niaux (cave), Central Pyrénées, France. Click for larger view. 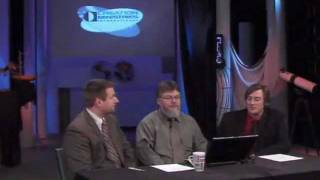 We do not know (there is no Scriptural evidence) if caves existed before the Flood. Even if they did, they would have been destroyed and buried in that global cataclysm. 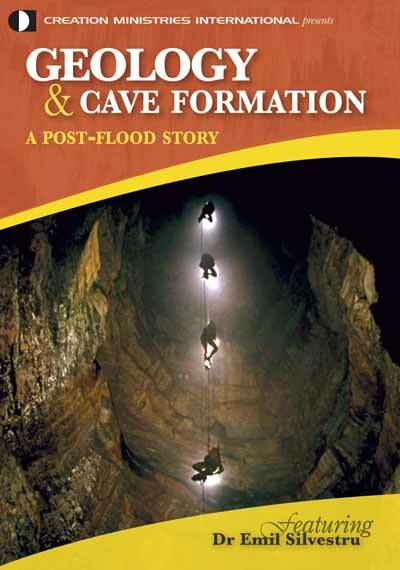 Thus, all of the caves existing today must have formed after most of the sediment had been deposited during the Flood. In fact, the fossils of creatures buried during Noah’s Flood can be seen lining the walls of many caves. Secular history teaches that caves were the very first shelters that humans used, yet Genesis 4:17 clearly indicates that humans built cities at the dawn of human history. Later, some people used tents (Genesis 4:20). The word ‘cave’ appears some 40 times in the Bible, in most cases as a hiding place, but also as a burial (and on one occasion as a dwelling) place. The first mention is in Genesis 19:30, referring to the cave in which Lot and his daughters dwelt. Thus, roughly 300 years after the Flood, caves were available to humans in the Middle East. Some of the oldest-known archaeological sites are located in caves, with Longgupo Cave in China the oldest thus far.1 In southwestern Europe (France and Spain) caves have also been used as religious sanctuaries and some of them decorated with extraordinary paintings. After visiting one of the most famous of them—Lascaux—the renowned painter Picasso said: ‘We have discovered nothing.’ So much for the evolution of painting from ‘primitive’ to post-modern. In modern times, caves have been used for various purposes, from preparing and storing cheese in France, Italy and the Czech Republic to hiding complete weapons factories during WWII. 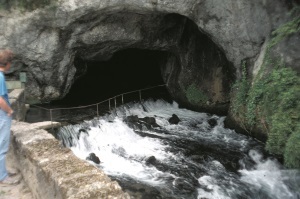 Some economically significant resources are also associated with caves. The world’s first drilled oil well, in southern Ontario, found oil in a buried cave;2 phosphates have been extracted from several caves; and aluminum ore (bauxite) is associated with old caves and karstlands. Finally, caves are often windows to huge subterranean water reservoirs in karst aquifers. Up to 25% of the world’s population obtains water from karst aquifers and new reserves have been identified. Caves are often excellent archives; whatever comes to rest in them (sediments, animals, crystals, etc.) is left undisturbed, protected by the calm environment. Thus scientists are often able to reconstruct a more accurate image of the past. More recently caves have gained public attention due to their use by terrorists in Afghanistan. Wanpo, H., Ciochon, R., Yumin, G., Larick, R., Scwarcz, H., Yonge, Ch., de Vos , J. and Rink, W., Early Homo and associated artefacts from Asia, Nature 378(6554):275–278, 1995. Return to text. Ford, D.C. and Williams, P.W., Karst Geomorphology and Hydrology, Chapman and Hall, London, p. 541, 1992. Return to text. 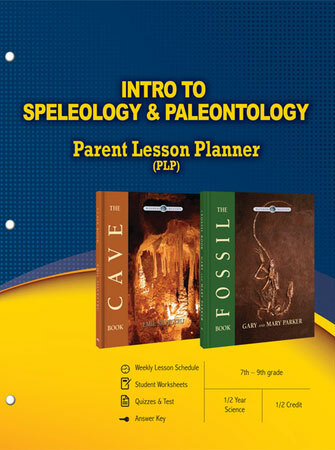 By elementary logic, dripstones (such as stalactites and stalagmites) are younger than the caves. 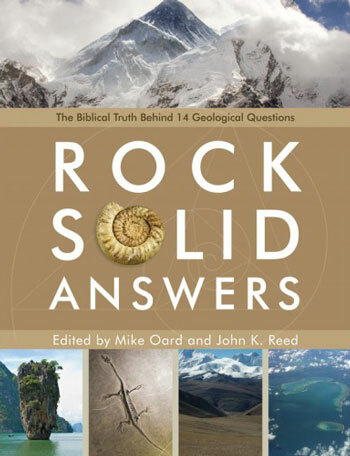 So, if caves formed after the Flood, how can we have thousands of dripstones and flowstones dated by radiometric methods to hundreds of thousands of years? One of the most beautiful show caves in the world displaying hundreds of huge, ‘saucer stack’ stalagmites. Some in this picture are over 10 m high. They can even take the shape of cypress trees! Such patterns emerge when the calcite-rich seepage water falls from great heights (over 90 m in this case), rapidly losing CO2 during the fall and especially when hitting the floor. Aven Armand, Causse Méjean, Massif Central, France (Lozère). Click for larger view. Let us focus only on stalagmites (the ones growing from the floor), and use uniformitarian assumptions (process rates have always been more or less the same). To find its age, we measure the rate at which a stalagmite grows today, consider it an average, and divide its length by that rate. Strangely, there seems to be little or no systematic measurement of stalagmite growth rates. Why should one bother, the thinking seems to go, when all one has to do is take the radiometric ‘age’ and divide it by the stalagmite’s length to get the rate? However, where growth rate has been measured in show caves (which are not necessarily the fastest growing), it varies from 0.1 to 3 mm (four thousandths to 1/8 of an inch) each year. Thus, to grow 2 m (7 ft), a stalagmite could take anywhere from 700 to 20,000 years. Not all stalagmites have the same length, so we can assume that some had higher growth rates and some lower ones. Logically, the long ones have grown more quickly. So, a 2 m (7 ft) stalagmite could form in 700 years. At 0.1 mm per year, another one would only measure 1 cm as it turned its first century. In any cave with dripstones, one can see dozens of such stalagmites side by side. Now, let’s consider one of the tallest stalagmites in the world, in the cave Armand (France)—shown above. At 3 mm per year it would have reached its present 38 m in 12,700 years.1 Clearly, this contradicts the ages of hundreds of thousands of years obtained from radiometric dating! But, on the surface, it would appear to be too old for the Flood. However, as I looked closely at this stalagmite, I realized that its growth must have been even faster in the past, because the water falls over 90 m (300 ft) from the roof to the tip of the stalagmite. This drop, plus the powerful splash at the end, would make it lose CO2 faster. Furthermore, the climate in the area used to be much wetter about a millennium ago, which would have accelerated growth even more. All the above assumes that the growth was continual, without major disruptions, which is reasonable, since we are talking about ‘historical times’. Even though all of this reasoning is fully within the uniformitarian mindset, it is not the ‘standard’ view by any means! In order to accommodate the most fundamental belief of secular origins science—the multibillion-year-old earth—here is what happens. First, stalagmites are cut along their long axis, the growth layers (see photo) are sampled, and the samples are dated by radiometric methods. Now, suddenly, tens and hundreds of thousands of years of age appear—even millions in some cases. And when that is not enough, paleomagnetism is used, and we go even farther back in time. Returning to our generic example: if a 2 m stalagmite were 200,000 years old, its annual growth rate must have averaged 0.01 mm per year. This is ten times slower than the slowest measured today! Long-agers try to explain this by saying that the growth occasionally stopped completely, perhaps for 10,000 years at a time. And after 10,000 years, they assume that nothing changed—the water drops start arriving again at exactly the same point, with millimetre precision, to fall on the tip of the stalagmite! Such explanations require common sense to take a nap. Thorough investigation shows that the path followed by water from the surface to the dripping point of a stalagmite is long, winding and extremely sensitive to the slightest change (remember, chemistry is involved, too). Moreover, huge amounts of field data reveal that karstland surfaces change dramatically and quickly, in a matter of centuries. Longest cave: the Flint Ridge-Mammoth Cave System in Kentucky, US, over 550 km (350 miles). Deepest cave: Voronja Cave, Caucasus Mountains, Georgia, 1,700 m (5,600 ft). Longest underground river: Son Trach, over 11 km (7 miles), in a cave called Hang Khe Rhy, Vietnam. Largest cave chamber: Sarawak Chamber in Good Luck Cave, Gunung Mulu National Park, Sarawak, Malaysia, a volume over 20 million m3 (700 million cubic feet). Longest submerged cave: Ox Bel Ha in Mexico’s Yucatán Peninsula, over 30 km (19 miles). Note this is an estimate from another cave, since the actual stalagmite’s growth rate has not been measured. Return to text. Jochen’s list of cave records, showcaves.com, accessed January 2003. Return to text.